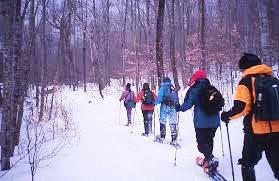 Take an adventure to the Pocono Mountains with a guided one-hour snowshoeing tour through the scenic Slateford Farm. Guide Chuck Cooper of Edge of the Woods Outfitters will show you all the basics of snowshoeing, provide you with the equipment and, as weather permits, give you a tour through the Delaware Water Gap National Recreation Area that is known for its rich history and wonderful views of the Delaware Water Gap. Why not make a weekend of it and purchase a snowshoeing package that includes snowshoeing for two and a studio villa for two nights starting midweek at $234 per night. Tours begin at the Edge of the Woods base located in the town of Delaware Water Gap, and are offered weather permitting. Don't miss this relaxing adventure escape weekend to experience the natural beauty of the Poconos covered in a mantle of white. Be sure to wear winter clothes including a good pair of boots and don't forget to bring your camera. Book today and take snowshoeing off your "bucket list".